Major General J.E.B. Stuart was a famed Confederate cavalry commander during the Civil War who served with General Robert E. Lee's Army of Northern Virginia. A Virginia native, he graduated from West Point and aided in quelling the "Bleeding Kansas" crisis. With the start of the Civil War, Stuart quickly distinguished himself and proved an able and daring commander. Leading the Army of Northern Virginia's cavalry, he took part in all of its major campaigns. 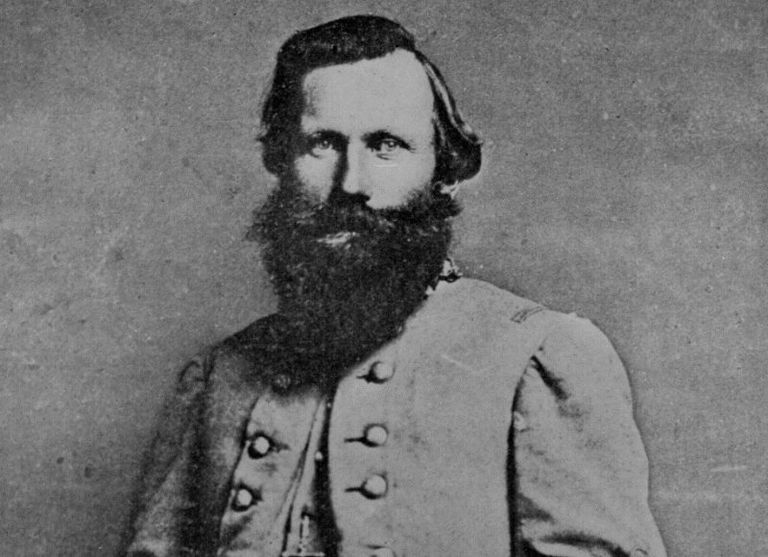 Stuart was mortally wounded in May 1864 at the Battle of Yellow Tavern and later died in Richmond, VA.
Born February 6, 1833 at Laurel Hill Farm in Patrick County, VA, James Ewell Brown Stuart was the son of War of 1812 veteran Archibald Stuart and his wife Elizabeth. His great-grandfather, Major Alexander Stuart, commanded a regiment at the Battle of Guilford Court House during the American Revolution. When Stuart was four, his father was elected to Congress representing Virginia's 7th District. Educated at home until age twelve, Stuart was then sent to Wytheville, VA to be tutored before entering Emory & Henry College in 1848. That same year, he attempted to enlist in the US Army but was turned away due to his young age. In 1850, Stuart succeeded in obtaining an appointment to West Point from Representative Thomas Hamlet Averett. A competent student, Stuart proved popular with his classmates and excelled at cavalry tactics and horsemanship. Among those in his class were Oliver O. Howard, Stephen D. Lee, William D. Pender, and Stephen H. Weed. While at West Point, Stuart first came in contact with Colonel Robert E. Lee who was appointed superintendent of the academy in 1852. During Stuart's time at the academy, he achieved the cadet rank of second captain of the corps and received the special recognition of "cavalry officer" for his skills on horseback. Graduating in 1854, Stuart placed 13th in a class of 46. Commissioned a brevet second lieutenant, he was assigned to the 1st US Mounted Rifles at Fort Davis, TX. Arriving in early 1855, he led patrols on the roads between San Antonio and El Paso. A short time later, Stuart received a transfer to the 1st US Cavalry Regiment at Fort Leavenworth. Acting as the regimental quartermaster, he served under Colonel Edwin V. Sumner. During his time at Fort Leavenworth, Stuart met Flora Cooke, daughter of Lieutenant Colonel Philip St. George Cooke of the 2nd US Dragoon. An accomplished rider, Flora accepted his marriage proposal less than two months after they first met. The couple were married on November 14, 1855. For the next several years, Stuart served on the frontier taking part in operations against the Native Americans and working to control the violence of the "Bleeding Kansas" crisis. On July 27, 1857, he was wounded near the Solomon River in a battle with the Cheyenne. Though struck in the chest, the bullet did little meaningful damage. An enterprising officer, Stuart invented a new type of saber hook in 1859 which was accepted for use by the US Army. Issued a patent for the device, he also earned $5,000 from licensing the design the military. While in Washington finalizing the contracts, Stuart volunteered to serve as Lee's aide in capturing radical abolitionist John Brown who had attacked the armory at Harpers Ferry, VA.
Finding Brown holed up at Harpers Ferry, Stuart played a key role in the attack by delivering Lee's surrender request and signaling the assault to begin. Returning to his post, Stuart was promoted to captain on April 22, 1861. This proved short-lived as following Virginia's secession from the Union at the beginning of the Civil War he resigned his commission to join the Confederate Army. During this period, he was disappointed to learn that his father-in-law, a Virginian by birth, had elected to remain with the Union. Returning home, he was commissioned a lieutenant colonel of Virginia Infantry on May 10. When Flora gave birth to a son in June, Stuart refused to allow the child to be named for his father-in-law. Assigned to Colonel Thomas J. Jackson's Army of the Shenandoah, Stuart was given command of the organization's cavalry companies. These were quickly consolidated into the 1st Virginia Cavalry with Stuart in command as colonel. On July 21, he took part in the First Battle of Bull Run where his men aided in the pursuit of the fleeing Federals. After service on the upper Potomac, he was given command of a cavalry brigade in what would become the Army of Northern Virginia. With this came a promotion to brigadier general on September 21. Taking part in the Peninsula Campaign in the spring of 1862, Stuart's cavalry saw little action due to the nature of the terrain, though he did see action at the Battle of Williamsburg on May 5. With the elevation of Lee to command at the end of the month, Stuart's role increased. Dispatched by Lee to scout the Union right, Stuart's brigade successfully rode around the entire Union army between June 12 and 15. Already known for his plumed hat and flamboyant style, the exploit made him famous across the Confederacy and greatly embarrassed Cooke who was commanding the Union cavalry. Promoted to major general on July 25, Stuart's command was enlarged to the Cavalry Division. Taking part in the Northern Virginia Campaign, he was nearly captured in August, but later succeeded in attacking Major General John Pope's headquarters. For the remainder of the campaign, his men provided screening forces and flank protection, while seeing action at Second Manassas and Chantilly. As Lee invaded Maryland that September, Stuart was tasked with screening the army. He failed somewhat in this task in that his men failed to gather key intelligence regarding the advancing Union army. The campaign culminated on September 17, at the Battle of Antietam. His horse artillery bombarded Union troops during the opening phases of the fight, but he was unable to conduct a flank attack requested by Jackson that afternoon due to heavy resistance. In the wake of the battle, Stuart again rode around the Union army, but to little military effect. After providing routine cavalry operations in the fall, Stuart's cavalry guarded the Confederate right during the Battle of Fredericksburg on December 13. During the winter, Stuart raided as far north as Fairfax Court House. With the resumption of campaigning in 1863, Stuart accompanied Jackson during the latter's famed flanking march at the Battle of Chancellorsville. When Jackson and Major General A.P. Hill were severely wounded, Stuart was placed in command of their corps for the remainder of the battle. After performing well in this role, he was badly embarrassed when his cavalry was surprised by their Union counterparts at the Battle of Brandy Station on June 9. In a daylong fight, his troopers narrowly avoided defeat. Later that month, Lee began another march north with the goal of invading Pennsylvania. For the advance, Stuart was tasked with covering the mountain passes as well as screening Lieutenant General Richard Ewell's Second Corps. Instead of taking a direct route along the Blue Ridge, Stuart, perhaps with the goal of erasing the stain of Brandy Station, took the bulk of his force between the Union army and Washington with an eye to capturing supplies and creating chaos. Advancing, he was driven further east by Union forces, delaying his march and forcing him away from Ewell. While he captured a large amount of supplies and fought several minor battles, his absence deprived Lee of his prime scouting force in the days prior to the Battle of Gettysburg. Arriving at Gettysburg on July 2, he was rebuked by Lee for his actions. The next day he was ordered to attack the Union rear in conjunction with Pickett's Charge but was blocked by Union forces east of the town. Though he performed well in covering the army's retreat after the battle, he was later made one of the scapegoats for the Confederate defeat. That September, Lee reorganized his mounted forces into a Cavalry Corps with Stuart in command. Unlike his other corps commanders, Stuart was not promoted to lieutenant general. That fall saw him perform well during the Bristoe Campaign. With the beginning of the Union Overland Campaign in May 1864, Stuart's men saw heavy action during the Battle of the Wilderness. With the conclusion of fighting, they shifted south and fought a vital action at Laurel Hill, delaying Union forces from reaching Spotsylvania Court House. As fighting raged around Spotsylvania Court House, the commander of the Union cavalry, Major General Philip Sheridan, received permission to mount a large raid south. Driving across the North Anna River, he was soon pursued by Stuart. The two forces clashed at the Battle of Yellow Tavern on May 11. In the fighting, Stuart was mortally wounded when a bullet struck him in the left side. In great pain, he was taken to Richmond where he died the next day. Only 31-years old, Stuart was buried at Hollywood Cemetery in Richmond.